$22.50/2 gal. to $225 for a large, beautiful, interesting specimen. Metasequoia glytostroboides, the dawn redwood is a most exceptional species. Beautful verdant foliage in the spring, braided trunk relief and attractive orange needles in the fall. Thought to be extinct until discovered in one valley in China. Fast growing and disease resistant. Tolerates wet soils, but does well in most average soils, as well. This plant was at one time indigenous to our area (60 to 1.5 million years ago), but went extinct, likely due to a changing climate and competition with species more well adapted to the changing conditions. Zones 4 - 8. While the bark and foliage are similar to another closely related genus of redwoods, Sequoia, M. glyptostroboides differs from the coast redwood in that it is deciduous, like Taxodium distichum (bald cypress). Similar to Taxodium, older trees may form wide buttresses on the lower trunk. Metasequoia is a fast-growing tree, exceeding 35 m (115 ft) in height and 1 m (3.3 ft) in trunk diameter by the age of 50, in cultivation (with the potential to grow to even greater dimensions). The trunk forms a distinctive "armpit" under each branch. The bark is vertically fissured and tends to exfoliate in ribbon-like strips. In Lichuan, Hubei, there is a dawn redwood forest consisting of barely 5,000 trees (by another count, around 5,400 trees, and some smaller groups (typically, under 30 trees each). Since its discovery, the dawn redwood has become something of a national point of pride, and it is protected under Chinese law and also planted widely. However, it is still listed as endangered in the wild. 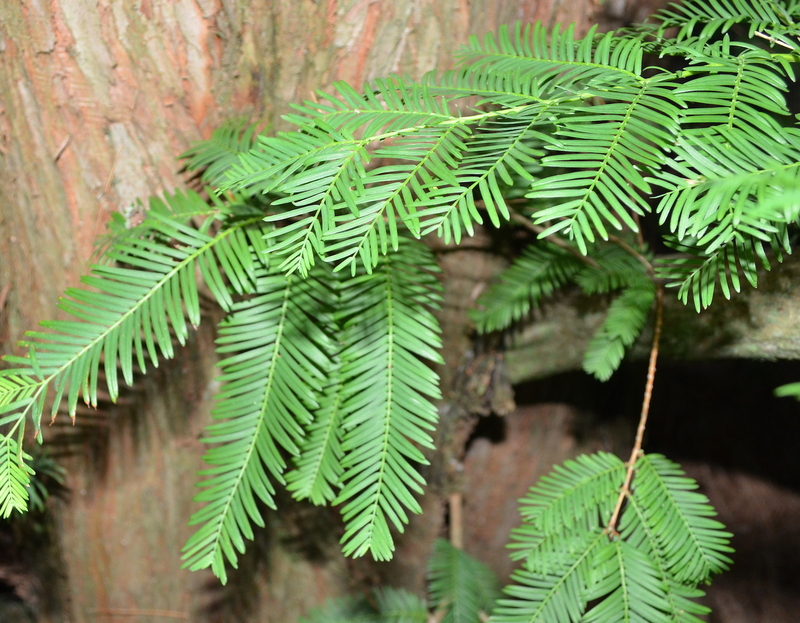 Cutting of trees or branches is illegal, but the demand for seedlings drives cone collection to the point that natural reproduction is no longer occurring in the dawn redwood forest. The species will continue to live in yards, parks and on roadsides all over China, but the M. glyptostroboides forest ecosystem could disappear when its mature trees die (probably not).